Peterborough United have done the double in the Skybet League One awards for August. Grant McCann picked up the manager-of-the-month prize while striker Jack Marriott was voted player-of-the-month. 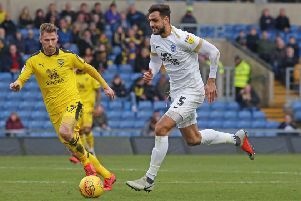 Posh won all four League One games in the opening month of the campaign, including a 4-1 away thumping of local rivals Northampton Town, and Marriott netted six times in four League One matches in August. McCann’s rivals were Paul Cook (Wigan), Paul Hurst (Shrewsbury) and Uwe Rosler (Fleetwood). while other nominations for player-of-the-month were Fleetwood goalkeeper Alex Cairns, Charlton defender Patrick Bauer and Rotherham forward Kieffer Moore.